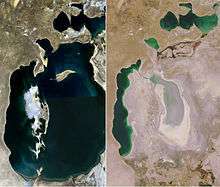 The shrinking Aral Sea, an example of poor water resource management diverted for irrigation. Environmental resource management is an issue of increasing concern, as reflected in its prevalence in seminal texts influencing global socio-political frameworks such as the Brundtland Commission's Our Common Future, which highlighted the integrated nature of environment and international development and the Worldwatch Institute's annual State of the World reports. The environment determines the nature of people, animals, plants, and places around the globe, affecting behaviour, religion, culture and economic practices. It should be noted that environmental resource management covers many areas in science, including geography, biology, physics, chemistry, sociology, psychology, and physiology. Fencing separates big game from vehicles along the Quebec Autoroute 73 in Canada. "The pairing of significant uncertainty about the behaviour and response of ecological systems with urgent calls for near-term action constitutes a difficult reality, and a common lament" for many environmental resource managers. 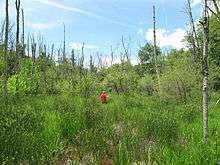 Scientific analysis of the environment deals with several dimensions of ecological uncertainty. These include: structural uncertainty resulting from the misidentification, or lack of information pertaining to the relationships between ecological variables; parameter uncertainty referring to "uncertainty associated with parameter values that are not known precisely but can be assessed and reported in terms of the likelihood…of experiencing a defined range of outcomes"; and stochastic uncertainty stemming from chance or unrelated factors. Adaptive management  is considered a useful framework for dealing with situations of high levels of uncertainty  though it is not without its detractors. 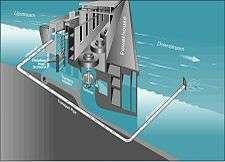 A common scientific concept and impetus behind environmental resource management is carrying capacity. Simply put, carrying capacity refers to the maximum number of organisms a particular resource can sustain. The concept of carrying capacity, whilst understood by many cultures over history, has its roots in Malthusian theory. An example is visible in the EU Water Framework Directive. However, "it is argued that Western scientific knowledge ... is often insufficient to deal with the full complexity of the interplay of variables in environmental resource management. These concerns have been recently addressed by a shift in environmental resource management approaches to incorporate different knowledge systems including traditional knowledge, reflected in approaches such as adaptive co-management  community-based natural resource management  and transitions management. among others. Many drivers compel environmental resource management to take sustainability issues into account. Today's economic paradigms do not protect the natural environment, yet they deepen human dependency on biodiversity and ecosystem services. Ecologically, massive environmental degradation  and climate change  threaten the stability of ecological systems that humanity depends on. Socially, an increasing gap between rich and poor and the global North-South divide denies many access to basic human needs, rights, and education, leading to further environmental destruction. The planet's unstable condition is caused by many anthropogenic sources. As an exceptionally powerful contributing factor to social and environmental change, the modern organisation has the potential to apply environmental resource management with sustainability principals to achieve highly effective outcomes. 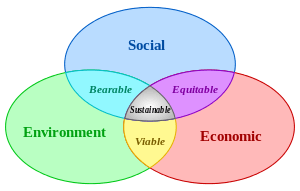 To achieve sustainable development with environmental resource management an organisation should work within sustainability principles, including social and environmental accountability, long-term planning; a strong, shared vision; a holistic focus; devolved and consensus decision making; broad stakeholder engagement and justice; transparency measures; trust; and flexibility. To adjust to today's environment of quick social and ecological changes, some organizations have begun to experiment with new tools and concepts. Those that are more traditional and stick to hierarchical decision making have difficulty dealing with the demand for lateral decision making that supports effective participation. Whether it be a matter of ethics or just strategic advantage organizations are internalizing sustainability principles. Some of the world's largest and most profitable corporations are shifting to sustainable environmental resource management: Ford, Toyota, BMW, Honda, Shell, Du Pont, Swiss Re, Hewlett-Packard, and Unilever, among others. An extensive study by the Boston Consulting Group reaching 1,560 business leaders from diverse regions, job positions, expertise in sustainability, industries, and sizes of organizations, revealed the many benefits of sustainable practice as well as its viability. 1 2 Arvai, J.; Gregory, R.; Ohlson, D. (December 2006). "Deconstructing Adaptive Management: Criteria for Applications to Environmental Management". Ecological Applications. 16 (6): 2411–25. doi:10.1890/1051-0761(2006)016[2411:DAMCFA]2.0.CO;2. PMID 17205914. ↑ Johannes RE (June 1998). "The case for data-less marine resource management: examples from tropical nearshore finfisheries". Trends Ecol. Evol. (Amst.). 13 (6): 243–6. doi:10.1016/S0169-5347(98)01384-6. PMID 21238285. ↑ Guo Z, Zhang L, Li Y (2010). "Increased dependence of humans on ecosystem services and biodiversity". PLoS ONE. 5 (10). doi:10.1371/journal.pone.0013113. PMC 2948508 . PMID 20957042. ↑ "Environment Management Group: Biodiversity". UNEP 1 2010. UNEP. 10 August 2011. 1 2 3 4 Berns, M.; Townend, A.; Khayat, Z.; Balagopal, B.; Reeves, M.; Hopkins, M.; Kruschqwitz, N. (2009). "The Business of Sustainability: Imperatives, Advantages, and Actions" (PDF). Boston Consulting Group Report. pp. 4–32. ↑ "Green Dragon Environmental Standard". Groundwork UK. Retrieved 24 September 2011.